Kindleberry Pi Zero W #piday #raspberrypi @Raspberry_Pi « Adafruit Industries – Makers, hackers, artists, designers and engineers! This is what I’m calling the Kindleberry Pi Zero W.
Yeah, I know it’s a mouthful, it just seemed like the only appropriate name. 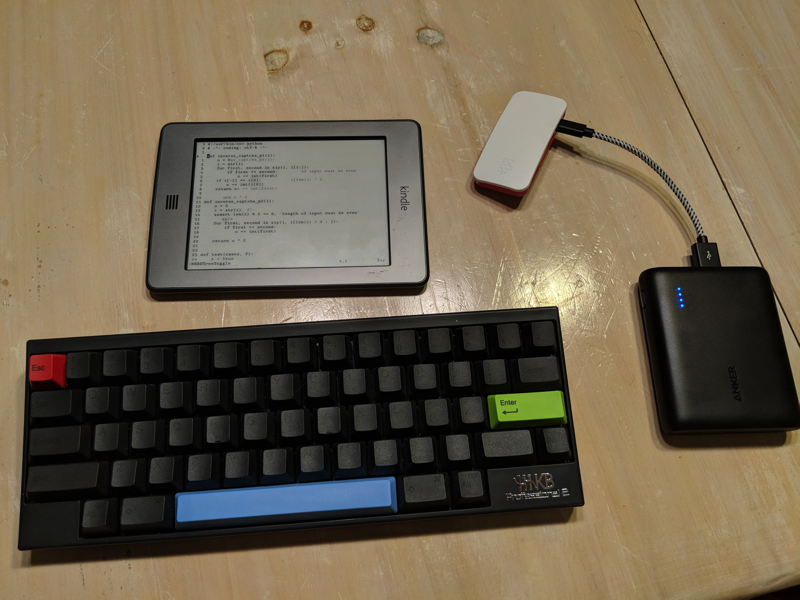 It’s a Raspberry Pi Zero W, a Kindle Touch, and a Bluetooth keyboard, all routed through my phone acting as a router and wireless access point. It’s a portable, minimalistic-ish computing solution in search of a problem. And I really like it! I remember reading about a Kindleberry Pi that consisted of a newer Kindle and an older Raspberry Pi. This is an update to that update. I figured, since I have a Kindle sitting around doing nothing, a spare-at-the-moment Raspberry Pi Zero W, and a nice lazy long weekend ahead of me, I might as well see how far I can get with setting it up. Turns out, pretty far! At the end of the weekend (plus an evening to iron the kinks out), I have something that I can throw in a bag and take on a plane for fun, portable computing. Ok, there might also be a slight hipster air about the whole thing that also calls to me, sue me.